Words can’t quite describe how excited and humbled we are to introduce you to the story behind Tatum’s Garden. This has been quite a journey for our family, one that began two and half years ago when our youngest child, Tatum, was unexpectedly born with Spina Bifida, which is a defect that occurs early in-utero, affecting the spinal cord and nervous system profoundly. 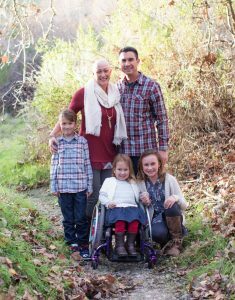 With two healthy children at home, Olivia and Wyatt, it had never occurred to us that this new baby girl we were welcoming into our family would have significant special needs. 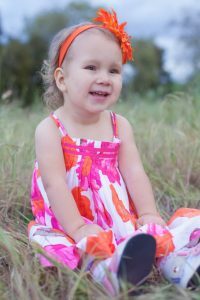 The first few months of Tatum’s life were a blur, as she recovered from several surgeries and we adapted to caring for her. Right away, we saw her sweet spirit shine through…and her brave persistence to battle and overcome many obstacles. So much has improved and changed for Tatum’s prognosis over the last two and a half years, and we have grown as a family right alongside her, with the help and support of our family and friends, gifted therapists who pour into her nearly every day, and this wonderful, generous community that has offered us so much hope. This past September, our family of five embarked on our first long family road trip, driving 17 hours to visit our grandparents at their mountain cabin near Yellowstone Park. Little did we know that the drive would take a big toll on our son, Wyatt, who is prone to motion sickness, or that something life-changing was about to happen. Only a few hours from our destination, Wyatt was sick again, and we pulled off the highway to clean up and let the kids burn off some steam. We did a quick search on our phones for the closest park to where we were, in Pocatello, Idaho, and found one just a few blocks away. We were genuinely unprepared for the amazing experience about to unfold. We walked up to a beautiful, huge playground, and our big kids ran off to explore. We were immediately struck by the beauty and uniqueness of the park…with the ground completely covered with poured-in-place rubber, huge, fun structures built with elaborate ramp systems, and dozens of swings. This was unlike any park we’d ever seen before! The signs at the entrance told us the story of this awesome place, called Brooklyn’s Playground, which was fundraised and built by their entire community, and coordinated by the family of a little girl with Spina Bifida, named Brooklyn. It told us how this playground is all-inclusive, and fully accessible to every child…a place for children to play side-by-side with their friends, whether they are able-bodied or need things like walkers or wheelchairs to move about. We looked around again and saw this playground through a fresh set of eyes…the eyes of parents with a child who is unable to move on her own. To take this all in was a bit overwhelming, and we found an adaptive swing to push Tatum in for a while, as our other children played. We noticed a young girl in a wheelchair playing in a large, rocking pirate ship structure, surrounded by her able-bodied friends. Part of the emotion we felt was in realizing we never knew playgrounds like this were out there…where all of our children could play together. With Tatum recently acquiring her first wheelchair, we hadn’t thought through the fact that when we take our family to a typical playground, she cannot participate and maneuver in sand or bark and be included. But in an environment like this, everyone was able to play, explore, and just be a kid. It became quickly apparent that there was nowhere like this in Monterey County…and in the next heartbeat, we knew why this chain of events had unfolded…we have a deep faith in God, and know it was no accident that we had found this awesome place, and we were being called to bring this exact vision to our hometown of Salinas. Since that moment of inspiration, just a few months ago, we have “jumped in with both feet,” if you will, into making this dream a reality! We have connected with the design company that built Brooklyn’s Playground, called Leathers & Associates, who have built over 3000 playgrounds around the world in the last 40+ years. We also aligned ourselves with a fiscal sponsor for fundraising, and are so blessed to be partnering with the Salinas Circle for Children, which has been supporting the special needs community in Monterey County for decades. Before we knew it, our Executive Committee was coming together, and we were searching for a location that would best serve the needs of kids in our community. In our initial research, we found that there are over 6,800 children enrolled in Monterey County public schools who have some type of special need, whether that is physical, emotional or mental, and that does not count children like Tatum who are below school-age, or those in the private sector. The need is huge! We also learned that there isn’t an inclusive, accessible playground like this nearby…it will literally be the only one between Santa Maria and Concord—roughly a 250 mile radius. We anticipate drawing in and providing an amazing play experience for hundreds of children a week, creating a true “destination” location in Salinas that is a regional attraction. We envision Tatum’s Garden being filled with custom play structures reflecting the rich agricultural history of the Salinas Valley, and showcasing the names of hundreds of families and local business owners who will make it all possible.